This doesn’t seem to work with the new version of Day One, but I think it may be a problem with the CLI rather than the script. I can’t add normal entries via the CLI either. Just a heads-up for anyone who may want to try this. I’m running it here with the new version of Day One, but you are right that there is a kind of change in the use of the CLI - it now requires the -j switch direct reference to a default folder (which you will see in the .doShellScript part of this script). I would try to get the CLI running on its own first, at the command line, with small fragments of test text, and perhaps experimenting with that -j switch, particularly if it needs adjustments for a network context etc. That is exactly what I am seeing. I sent a message to them a few days ago, but they have not yet gotten back to me. Did you get this working? Despite the update, the CLI is still not working for me. The `dayone` command line tool was originally written to work with _Day One Classic_, and by default writes its entries to the default _Day One Classic_ journal directory<sup id="a1">(#f1)</sup>. 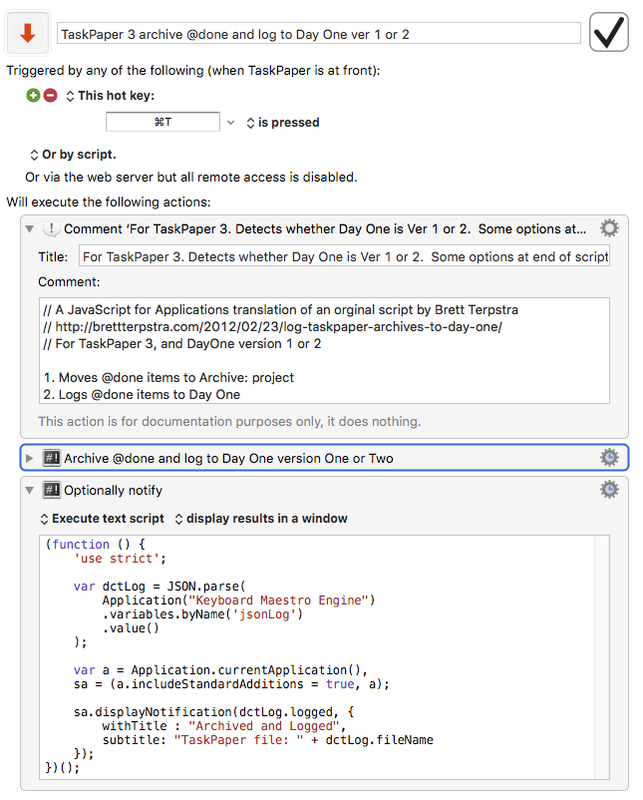 If you want to use the `dayone` tool to write entries in to Day One 2 instead, there are a couple options.